Dental implants are an option for permanently replacing missing teeth. They mimic your natural tooth roots and are fully functional, natural-looking replacements for your missing teeth. 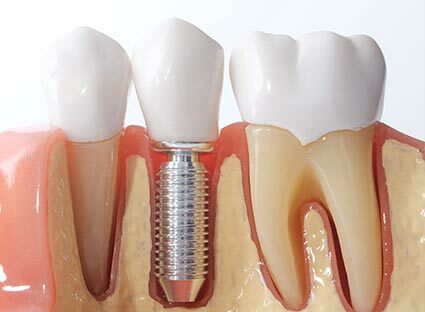 An implant is a small titanium metal screw that is carefully inserted by our skilled dental surgeons into the jawbone to replace a missing natural tooth root, acting as a support for crowns, bridges or holding dentures firmly in place. Dr Chatterjee trained with top implant specialists Prof Ucer at Trafford Hospital and Dr Austin Hughes and has been placing implants since 2011. He uses the popular Straumann and Sweden and Martina systems, depending on your individual needs, and is also experienced in bone grafting if your existing jawbone is insufficient for implants. Implants can restore the smile you have lost or offer you the smile you have always wanted. Start enjoying your favourite foods like apples, steak and even corn on the cob again with confidence and without the plastic of dentures covering the roof of your mouth. Only dental implants can permanently replace the roots of missing teeth and eliminate the need for sticky denture adhesives and even for dentures themselves. Implants look and feel just like natural teeth. Implants can help conserve your bone structure and support your facial tissues. They can reduce or eliminate bone atrophy, which causes “shrinkage” or facial cosmetic changes. Implants eliminate the need for cutting natural teeth to replace a missing tooth and offer a permanent solution that cannot decay. Has tooth loss left a gap in your life? Give us a call on 01925 768 111 and book your first dental implant consultation appointment today!